I first became acquainted with Rappin’ Is Fundamental aka RIF, after hearing a song called “The Doo-Bop Song”, which was a collabo with Miles Davis. As the story goes, Miles was sitting in his New York apartment with the windows open, listening to the sounds he heard on the streets. He wanted to record an album that captured these sounds, so he called up his friend, up and coming hip-hop mogul Russell Simmons, and asked him to find a young producer who could re-create the sounds he heard. Russell Simmons eventually brought him Easy Mo Bee. For those who don’t know, Easy Mo Bee came on the scene in the later eighties and has produced tracks for the likes of Kane, Pac, Biggie, just to name a few. In my opinion he is severely underrated. In there early nineties Mo Bee and his partners AB Money and JR The Stone Cold Lover (who I’ll refer to for the rest of this review simply as JR) linked up to form the group Rappin’ Is Fundamental (RIF). 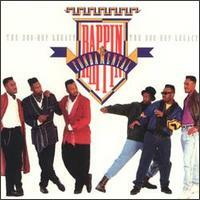 They actually referred to themselves as a Doo-Hop group, mixing hip-hop sensibilities with doo-wop harmonies. Mo Bee would go onto to produce Miles Davis’ final album (Miles actually died while still recording it) Doo-Bop, which included “The Doo-Bop Song” that was released as the lead-off single off Miles’ Doo-Bop album. I bought Rappin’ Is Fundamental’s debut (and only) album Doo Hop Legacy for two reasons: one, I’m a fan of Easy Mo Bee’s production. Secondly, I thought “The Doo-Bop Song” would be included since the single was released around the same time as Doo Hop Legacy. This is my first time listening to this album and I’m not even familiar with the singles they released from it. Hopefully Mo Bee’s production will lessen the disappointment of the missing “The Doo-Bop Song”. Swing Of Things – AB Money, JR, and Easy Mo Bee each spit a verse on this opening track. All three emcees sound similar in tone and delivery making it hard to distinguish whose who, and all three deliver unimpressive verses. Mo Bee’s instrumental sounds like New Jack Swing meets his signature funk, which I thought was pretty nice. Highway To Heaven – This one open with a sound bite from a man slighting the church before Mo Bee’s instrumental drops and takes the listener to chuuch. Mo Bee’s production reminds me of Pete Rock’s “Down With The Kings” instrumental mixed with a little black Pentecostal/Baptist church vibe. None of the trio say anything worth remembering but Mo Bee’s beat is funky. Now That You Know My Name – This song is the embodiment of what I envision when I hear the term Doo-Hop. Mo Bee’s instrumental has a 1960s Motown vibe with a hip-hop twist. The trio even sing the hook in a melody reminiscent of the Temptations or 4 Tops. I had to listen to this a few times before it started to grow on me. This was decent. Them Boys Are Getting There – This is the first complete dud of the evening. Mo Bee’s shares production duties with someone going simply by Tomie. They provide a generic and very cheesy Casio keyboard like instrumental. To add insult to injury, the unimpressive instrumental only exposes how malnourished the trio’s rhymes are. Mo Bee leads off on this one and mentions something to the effective of critics saying his beats sound like De La Soul’s? I doubt they were talking about this garbage. You Wanna Trip – Mediocre at best. Speak Softly – This instrumental has that vintage Mo Bee funk that he would come to perfect in the next few years. I would have liked to hear Kane rip this one to shreds. Rapping Is Fundamental – Two words: Corn. Ball. Ain’t No Smoke (Without Fire) – Mo Bee’s nice mid tempo groove is built around a slightly drunken piano loop that the trio do their best to tackle. Big Daddy Kane makes a short cameo at the end of the song to shout out RIF. Really? If you’re going to get the legendary BDK to make an appearance on your album you should at least get one verse out of him. Especially when your crew is as lyrically deficient as RIF. Whenever You Need An MC/ I’ll Be Around – Hot mess. Figurin’ To Get Ill – The “Figurin” in the song title should be replaced with “Finna” since that is what they actually say on the hook. Mo Bee brings his hardest instrumental of the evening and turns in his best verse (and probably the collective’s best verse) of the album. AB Money made me chuckle when he proclaims to “be so bad he can pat himself on the back”. News flash AB, but any human with one good arm can do that, bruh. I Wonder If She Thinks Of Me – The Doo-Hop Legacy ends with JR, AB Money, and RIF’s manager Sudan Lawrence each spitting a verse as they reminisce over their exes. Mo Bee’s instrumental was decent and the hook is probably the tightest doo-wop hop harmonies on the entire album. Doo Hop Legacy lives up to its title as all 11 songs are built around soul samples blended with doo-wop type harmonies. Unfortunately, only about half of the song are worth listening to, and that’s only on the strength of Mo Bee’s production. Lyrically, AB, JR and Mo Bee leave a lot to be desired behind the mic. I’m still salt that “The Doo-Bop Song” was not included on this album.